It’s been really, really hot lately. It seems like, only a month ago, I was praying for the heat. Be careful what you wish for though–being pregnant in the summer is no joke. With Gia I was due in mid-July, and I had no kids. So, being a beached whale and hanging inside, on the couch, with the AC set at 68 was a no brainer. This time? Not so much. Gia loves being outside and wants to play, and I can’t justify letting her watch hours of tv just bc I’m housing her little brother in my belly. 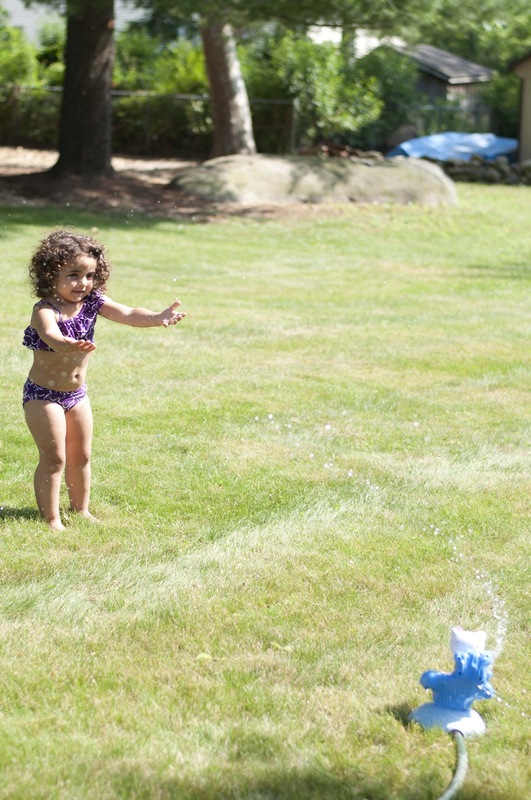 Enter our new Hello Kitty sprinkler: perfect for a hot day. Gia absolutely loves water and loves to play with it. She could stay in the bathtub for hours and uses her water table all the time. She was a little unsure of the sprinkler at first, but then she got into it. And then she got really brave and let it get her pretty wet. She played for about 40 minutes (that’s long in toddler time!) and had a ball. I foresee many sprinkler days ahead!